Essential to the Group’s ongoing success is the employment of high-quality people who benefit from living and working in Dubai, a modern cosmopolitan city offering one of the most desirable lifestyles in the world. 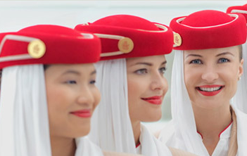 The Emirates Group employees come from over 160 nationalities, receive tax-free salary and benefits package, and are offered professional development opportunities to further their careers with the organisation. The Emirates Group offers an extensive range of employment opportunities as diverse as the 150 nationalities we recruit every year. Apply online by browsing through our current list of vacancies or conduct a search to find a suitable vacancy.